Every year since we’ve been at our house we’ve had an annual bonfire and star party. We get some of the neighbors and our friends together, build a small fire and make some smores. We do it right around the time of the annual Perseid meteor shower. We tend to miss the peak by a few days, but we always seem to see a few. And, as we always do, we got out my two telescopes and showed the neighborhood a few night sky objects. This year Jupiter was the only early evening planet visible; but it is my favorite. (Saturn’s close — but setting too early in the evening this year’s August). Here’s a photo of how Jupiter looked for us through my Meade ETX 125, courtesy of another amateur using the same scope as I have. Jupiter is great because the kids (and parents) can immediately identify it. It was really appropriate this year, the 400th anniversary of Galileo’s first astronomical use of the telescope. The kids kept asking what the stars were that surrounded Jupiter. They loved the fact that they were Jupiter’s moons. They even suffered through me talking about the volcanism of Io, the oceans under the surface ice of Ganymede and Europa and how Galileo confirmed the Copernican world view by asking the same question that they had. Even with the city lights, we were able to get a few deep sky sights in scope. After a little star hopping (aided by a new friend to our family – Tom – a geek like me who likes amateur astronomy), we were able to get the great Hercules cluster in my larger 8″ home built dobsonian scope. The cluster (M13) is a globular cluster with about 200,000 stars sitting in the halo of our Milky Way Galaxy. In the scope it looks like a dandelion fluff. Impressive when you think that it contains that many stars — but a bit less identifiable than Jupiter. Here’s what it looks like in a scope like mine after a few minutes exposure. As I said, in my scope, with city lights and lower magnification — more of a smudge. I was also able to get M39, an open cluster, in my larger scope. Unfortunately, by the time I got it in focus, most of our guests had taken off. I wish I had gotten it in view earlier, because it probably would have gotten more of a response than the Hercules cluster. 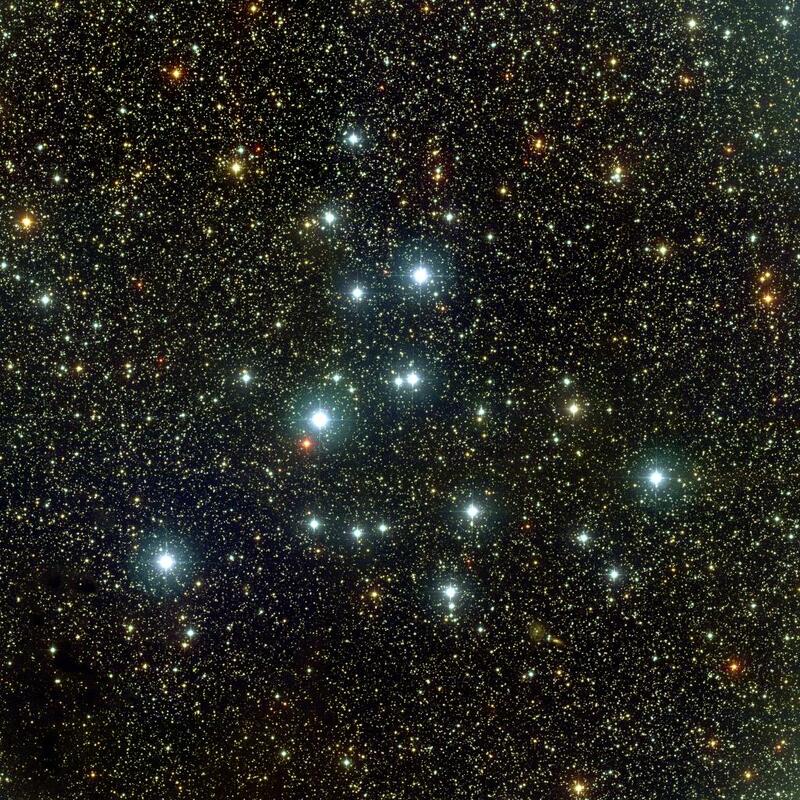 The stars in the open cluster are gorgeous in the scope, almost like jewels. Here’s a picture of them through a much larger telescope — certainly not what they look like through mine — but it very much catches the effect. Most important to me, my kids got a kick out the the evening. They didn’t last that long — my youngest was going to bed only just after sun set. Noelle got to see most of the sites. And, of course, she had her fair share of smores. I’m already looking forward to next year. Diane Rehm Show. On Thursday, hosted Jill Tarter, Director of the Search for Extraterrestrial Intelligence Institute’s Center for SETI Research. Jill Tarter also has a neat little presentation when she recently received the TED prize. I’ve posted on TED talks before. Discussion around SETI @ 50 years! Diane Rehm Show. On Wednesday, hosted Maxwell Mehlman, professor of law and bioethics at Case Western Reserve University and the author of “Wondergenes”; “The Encyclopedia of Ethical, Legal, and Policy Issues in Biotechnology”; and “Access to the Genome” and one of my old professors. The conversation is about his recent book, Price of Perfection. The Lost Decade. What’s been the economic growth rate over 1999 – 2009 and how does it compare to others during the modern post-War period. Ouch. Co-Ops. What are they and are they a bridge to bipartisan healthcare reform? Recession bottoming out? One of the two steel blast furnaces in Cleveland are finally firing up again. “[W]e are restarting C-5 blast furnace, a steel shop, hot mill, pickle line, tandem mill and galvanizing line at ArcelorMittal Cleveland…However, we do not expect demand to return to the levels seen in 2008 for sometime yet and remain cautiously optimistic for a low and progressive recovery.” When both furnaces were turned off (I think late last year), it was a signal of the unusual depth of this ‘Great Recession.’ I’ve been watching to see when they’d fire up again. This is a good sign. The Boston Globe’s big picture does it again with some amazing photographs remembering the Apollo 11 mission. Take a look. The one photo (Earth-rise) was on my wall in my bedroom growing up. Gorgeous. is made of light-weight beryllium and has 18 hexagonal segments. relatively speaking becomes a giant shield about as big as a tennis court. It s huge. via Q & A with Dr. John Mather on the James Webb Space Telescope | Universe Today. I recently was exploring Hulu. It’s a really fantastic site if it has the shows you like to view. On his Bad Astronomy Blog Phil Plait turned me back to Hulu because it has all of the old Cosmos series. Remember that one? It was on PBS in the 1980s, done by the late Carl Sagan, and I think it popularized science, astronomy astrophysics for a generation of us. As Phil observes, Carl Sagan’s Cosmos did more than the typical Discovery channel show does today — it took its time to explain, through discussion, observation and thought experiements, everything from the Copernican revolution to the impact of Einsteinian relativity on space travel to the Drake equation. I foundly recall watching this with my parents when it first aired. A big reason why I enjoy science, and particularly astronomy, to this day.